Intro: The story of Chris Pratt praying for director Kevin Smith. Apparently, you cannot pray on Twitter anymore. The issue: “Thoughts & Prayers” being absent sentiments rather than action words. Point of this story is that even as people of prayer, we can lose sight of prayer’s importance. When thoughts and prayers are wished, but not acted upon, we become like the Pharisees, the priests of the temple whom Jesus always contends with who like the appearance of righteousness, but are not sincere about truly following God. What this sermon is about - Prayer/worship - Christ overturning the tables that keep us from him. Now Jesus comes on the scene. And there is this prophecy in Malachi and Zech. that indicated that the Messiah who was to come would purify the Levites. I’m sure many who knew the Scriptures would have thought of that, hearing of Jesus miracle at Cana which immediately precedes this story. He went from turning water into wine to overturning tables. Jesus, with his family and disciples - as all good jews would have done - made their way to Jerusalem for Passover. And Jesus did not like what he saw in the temple. In the outer Court of the Gentles, there were all kinds of merchants selling various animals for sacrifice. By Jesus’ day, this practice had escalated into a major business for the priests and had replaced spiritual worship in the courtyard during the Passover season. The priests transformed this area from a place of quiet prayer into a noisy bazaar. It was virtually impossible for Gentiles to worship there, the only courtyard accessible to them, with all the business going on. Imagine your place of prayer defaced in such a way? The only place you could - in their theological understanding - access God, was filled with the noises of crowds and animals and coins and merchants. And so Jesus fashions a whip and drives them out. Accusing them of turning his father’s house into a marketplace. What’s interesting is that the prophecy of Zech. (14:21) that I mentioned earlier, indicates that “In that day” - meaning the coming of the kingdom of the Messiah - there will be no merchant in the house of the Lord. So this overturning tables in the temple had to do with Gentiles no longer having a place to pray and with this, God’s kingdom has come in Christ. The Zeal for the Lord’s house (Psalm 69:9) fully displayed in driving consumerism from where the presence of God was said to dwell. But this is not all. This story takes a turn. When having his authority questioned (show us a sign), Jesus indicates that they destroy the temple and he’ll rebuild it in three days. They thought it was Herod’s temple, but Jesus was referring to himself. That he is the Temple. And that he will be destroyed by them, and be raised in three days. But this isn’t the kind of sign they were looking for. But the reality of the situation is that Jesus does have the authority. For he is God incarnate. Bringing with him the fullness of the presence of God. So God’s presence is no longer present in the Temple but in the person of Jesus. He will drive out the sacrificial system by becoming the all-encompassing sacrifice himself. He will secure the places of prayer for the Gentiles by including them in his kingdom and in his plan of redemption. The Pharisees and the teachers of the law are offended because Jesus calls out their temple practices and asserts himself as the authority. The key idea I’d like to highlight is the reality of the Gentiles worship situation. They had very literal obstacles in the way of their prayer and worship. The teachers of the law set up real, physical barriers out of a lack of concern for the Gentiles who attended Temple. And Jesus overturned those barriers. No longer would the Gentiles be hindered from approaching God. Nor anyone else for that matter. No longer would the Temple be the be all end all location where forgiveness and grace are given. It is now in the person of Jesus. Soon you will find more forgiveness and grace at Golgotha than you will on the Temple mount! Imagine the boldness of such a claim. A question for us to ponder is what obstacles are erected in our own worship of God? What obstacles hinder our prayer? Perhaps we even shy away because of persecution from Twitter trolls? Perhaps it’s these tragic events that never seem to end that have us doubting our own approach to prayer? Perhaps we believe in the lie that it can only be in a certain way or a particular place that we can pray to God? These are very real questions. And these are a little safe, actually because it places us in the shoes of the Gentiles who aren’t even mentioned in the text but are rather implied. But instead of taking the place of the Gentiles, what if we are the money changers? The hinderers. The ones promoting consumerism. The ones that interrupt the sacred space of folks earnestly and honestly seeking God? This is the importance of prayer. Prayer enables us to see ourselves a bit more clearly. Prayer affixes kingdom lenses to our eyes. If we do not desire prayer, we cannot be changed by it. Our hearts cannot be changed by it. 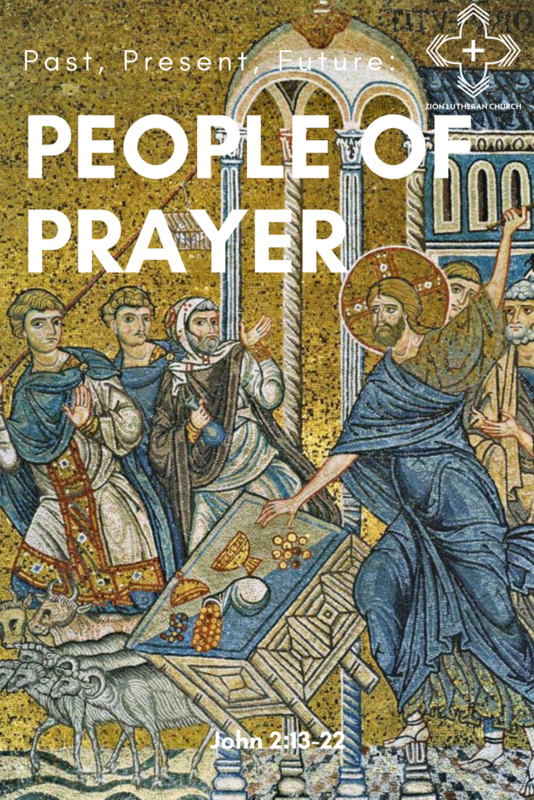 There is a reason that Jesus says pray like this and we say “Thy Kingdom Come.” Prayer enables us to throw over the tables of consumerism - which is a very real temptation in our culture. Prayer enables us to throw over the tables that turn God’s Kingdom into our own little kingdom - it enables us to turn over the tables in our lives and in our walk with God that distort what God is all about. Prayer enables us to recognize when it’s our own tables in the way. This is our very own core values statement. The people of Zion recognize the importance and power of prayer. May we also recognize that the presence of God is not confined to a temple. And the good news is that it isn’t confined to the cross either, but indeed the temple was rebuilt in 3 days. Our Lord is Risen. And he has come to overturn the tables of the merchants and money changers that occupy a place in the outer courts of our hearts. And reclaim that space for himself. To Relabel that place as a place of prayer and renewal. To Reorient our senses to the recognition that it is his kingdom. Not ours. But he invites us to share it with him. In intimate communion with him as he transforms our hearts and minds through his abundant gifts. And maybe it is best to think of prayer as a gift. And this isn't one of those gifts that we repackage and regift next Christmas. This is a gift that is given to each of us. And we can either receive it become familiar with it and let our hearts be changed by it and let God work through it — or not. But Christ has cleared the obstacles and invites us to approach his throne of grace with confidence that he will hear us.